Dog sleds aren’t just for Alaska. Colorado has a strong dogsledding scene, too. If you’re looking for an adventurous and novel way to experience the snow on your winter vacation in Colorado, consider trading your skis one day for a spot on a dog sled. Dogsledding has grown “exponentially” over the past few years, according to Colorado-based Alpine Adventures, which serves the Vail Valley ski towns, plus Copper Mountain, Breckenridge, Frisco and Keystone. Never gone dogsledding before? That's no problem. Here’s your guide to getting the most out of the experience: what to expect, what to bring and wear, the dos and the don’ts and how to get the most out of this special experience. What kind of dogs pull the sleds? Dogs are typically Alaskan and Siberian huskies, who are bred and trained for this task. You may have up to 12 dogs pulling a sled. Don’t worry about them getting cold. They prefer the cold and have a special layer of fur just for it. Fun fact: Alpine Adventures says sled dogs are the strongest draft animal on Earth and can quickly pull more weight, pound-for-pound, than even draft horses. Sled dogs can run more than 150 miles per day, according to Steamboat-based Grizzle-T Dog and Sled Works. Even though they are working, many outfitters encourage participants to pet and take pictures with the dogs (when the sled's not in motion, of course). The dogs are friendly and used to being around many different people. Look for dogsledding tours run by professional outfitters with trained guides who not only know how to run the sled and interact with the dogs, but also how to take care of travelers in the backcountry and how to navigate the area (in case of an emergency, like a blizzard). But travelers are often surprised to learn they may be asked to take on different roles in the experience. You may “run” the dogs, ride in the sled (that’s the best chance to take pics; not while running the dogs), ride on a sleigh or snowmobile with the guide or alternate duties throughout the tour. You can sign up for different options, including a lesson on how to mush. You may learn how to control the speed, stop the sled, counterbalance the sleigh, go up and down slopes and handle the turns. Expect a huge adrenaline rush when you first start. It can be hard to relax and not feel afraid of falling off. But this, ironically, increases the chance of you falling off, ​because if your body is rigid, can make it extra hard to smoothly take on the bumps and turns. Good Times Adventures in Breckenridge runs six-mile tours along the Swan River Valley. The experience lasts about an hour. For something more in-depth, Durango Dog Ranch in Durango offers half-day dogsledding tours (9 a.m. to 1 p.m., starting at a specific trailhead) in the San Juan Mountains. Participants get a mushing lesson and the chance to be the musher. The tour ends with a picnic while the dogs rest. Or for the ultimate adventure, the Durango Dog Ranch coordinates all-day mushes deeper into the national forest. 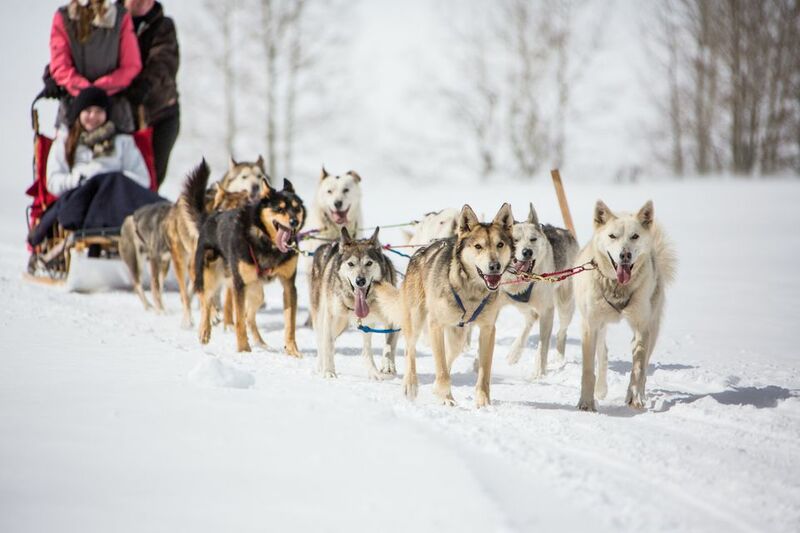 These seven-hour trips only allow for one participant per sled, with their guide, and you are required to be in good physical condition (and ready to run with the dogs, if necessary). This is not ideal for beginners who have never dogsled before. As always in Colorado, make sure you check the weather, but also prepare for surprises. As with skiing, dress in layers and wear those goggles or sunglasses and good boots. Don’t forget gloves, a hat and a scarf; maybe pack warmer packs to stick in your boots and gloves. If you have a snowsuit, wear it. If you need one, ask your outfitter if they have one you can borrow or rent. Like with any snowy experience, it’s best not to wear jeans and cotton, which are the absolute worst when they get wet and cold. It’s best to wear waterproof apparel and clothes that dry quickly and wick away moisture from your skin. Leave your slick cowboy boots at home. It’s not advised to wear real or fake fur when dogsledding, according to Alpine Adventures. Oh, and don’t pack dog treats. The huskies can’t have them. They get their own snacks later. It’s best to come over-prepared, rather than under-prepared, Alpine Adventures advises. Always wear sunscreen in the mountains, any time of year. Don’t forget chapstick for your lips, too. Definitely bring a camera. You never know what wildlife you might see along the way, from coyotes to deer. Also, you will have to share your weight with the outfitter, to help pair you with the right number of dogs. This may strike some travelers as strange at first, but it’s important for the dog’s sake. Unfortunately, no. Young children (typically under 4, but some guides allow younger, depending on the kid and weight) and pregnant women are not allowed to ride, for safety reasons. If you’ve been drinking alcohol or are visibly under the influence of a substance, you aren’t going dogsledding. Many ski towns and mountain towns across the state are home to dogsledding companies. Some tours, like Mountain Musher in Vail Valley, go on private trails, so you don’t have to worry about sharing the trails with snowmobiles. Most dogsledding tours run from mid-November through mid-April, or essentially alongside ski season, give or take. It all depends on the snow. Are there summer dogsled activities, too? Yes. Huskies love to pull, and in the summer, you can put these sled dogs to work with your bike. Snow Caps calls it a Tug & Tow. The Tug & Tow Bike Leash connects to a bike, scooter or cart for something called “urban mushing.” Mush through town and along the bike path and give the dogs exercise while giving your legs a break. Some outfitters also offer snow-free tours where the dogs pull carts on wheels, instead of sleds.